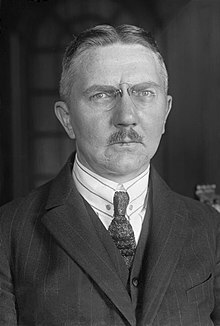 Hjalmar Horace Greeley Schacht (22 January 1877 in Tingleff – 3 June 1970 in München) was a German politician and minister for economics during the time of the Third Reich. In the Weimar Republic he was the president of the Reichsbank. He was also one of the 24 defendants at the Nuremberg Trials. His middle names come from the American politician Horace Greeley. This page was last changed on 21 July 2017, at 12:00.